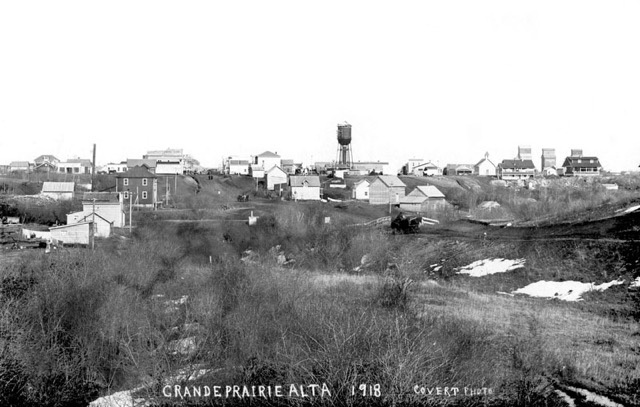 Mostly log structures – outdoor plumbing – wood burning stoves for cooking and heating – faint lights flickering from coal oil lamps and hurricane lanterns at night; that’s a snapshot of “1914 Grande Prairie”. There were backyard gardens, chicken coops and cowsheds; the source of vegetables, meat and eggs for many of the fifty townspeople while hitching posts not parking meters lined Richmond Avenue, wide enough for horse drawn conveyances to maneuver. Homesteads had to be cleared before they became productive and in the meanwhile many of the settlers trapped, hunted or worked in small scale logging operations during the winter to provide money for staples such as sugar, coal oil for lamps and lanterns and other items the land could not provide. With money in scarce supply bartering was commonplace. The home’s highest tech gadget was the treadle-powered sewing machine. On main-street the Hudson’s Bay Raw Furs Department that had a presence on “The Grande Prairie” a century earlier purchased and marketed furs for the trappers. Meat from moose, deer, elk and even bear was common table fare. Hides from the animals became foot ware, robes and rugs; nothing was wasted. Following on the heels of the Hudson’s Bay Company was the Catholic Mission shown above on the banks of Bear Creek north of Richmond Ave. Later a Catholic School was added that featured an outdoor rink for many years. 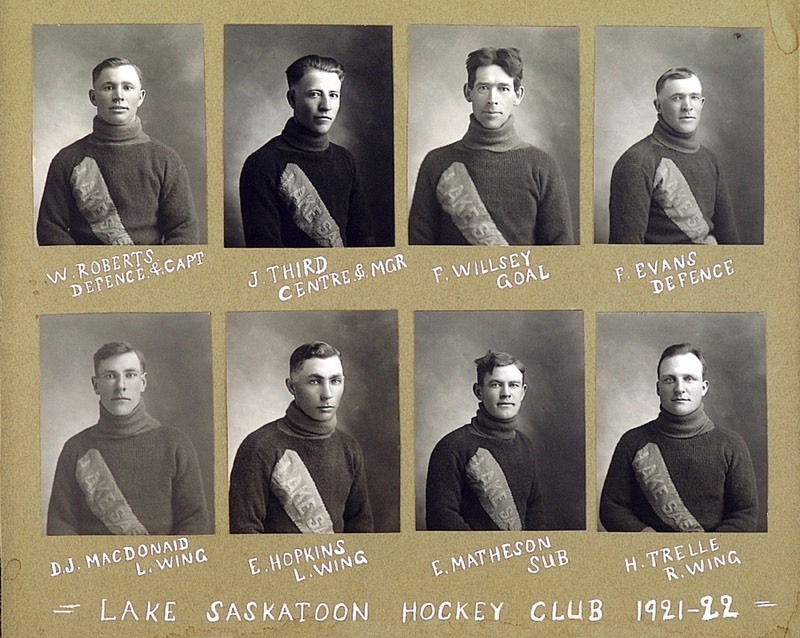 Unfortunately no pictures of the 1914 Lake Saskatoon team can be found but a team from lake Saskatoon seven years later includes several of the players that performed for Lake Saskatoon in the 1914 contests. GP Hockey Legend, Johnny Macdonald was a sixteen-year old student at the recently organized Grande Prairie High School at the time and played defense for Grande Prairie. His recollection of the game was captured in an interview with Grande Prairie Historian, Isabel Campbell. Johnny reported that years following the historic match Grande Prairie resident Henry Monkman recognized Johnny as he collected fare for a Saturday night hockey game at the Memorial Arena. Henry asked Johnny if he remembered ending up in a snow bank during a game played many years earlier against Saskatoon Lake. “Of course”, replied Johnny, “but where were you?” Henry responded that he was a seven-year old Saskatoon Lake fan standing in the snow bank into which local farm boy, Herman Trelle unceremoniously pitch-forked Johnny to end his rush into the Saskatoon Lake zone. Herman Trelle, shown above was a Saskatoon Lake farmer who became the World Wheat King not just once but five times and during his life time earned recognition 186 times on the national and international stage for the quality of his grain. Herman Trelle’s accomplishments reflected the remarkable potential for farming and other opportunities in the Peace attracting numerous adventure seekers and entrepreneurs to the region. How the teams maintained a fast pace is a mystery considering that each team came with a single shift of players that included a goalie, a forward line and a rear guard identified as cover and point players. The seventh player was a rover: typically a fast sniper who could play anywhere on the ice at any time. Assuming the game consisted of three thirty-minute periods – each man on the roster played three thirty-minute shifts. Compare that to three or four lines turning thirty-second shifts that are typical in organized hockey today. One might assume that the 1914 players were generally in good condition with the advantage of cardio vascular fitness going to farm boys with responsibility for chasing milk cows into the barn twice per day. Fitness training was an integral part of their regular workday. None-the-less, maintaining a fast pace for an entire game without relief suggests super human endurance. An interesting footnote to game two is that a Saskatoon Lake spectator, C. Richardson, took a cold plunge. Breaking through thin ice was just one of several hazards associated with a rink on lake ice. Richardson was no ordinary fan. He was Vice President of the Saskatoon Lake Hockey Association. According to the record, he was one of two hundred fans who watched the game. Where the two hundred fans came from is not indicated but it is a remarkable statistic considering that Grande Prairie was the largest community north of Edmonton and upon its incorporation as a hamlet in 1914, its population was listed at fifty. The populations of Grande Prairie and Lake Saskatoon combined could not have accounted for 200 people. Whatever the number of fans - they stood in snow banks surrounding an ice patch cleared for the game braving subzero temperatures while the players skated and attempted to control a puck on rough and rippled ice. There was no flooding of the ice between periods. None of this was a deterrent to players and fans in 1914. To the extent possible they dressed for the weather conditions but you may be sure there were frozen body parts. One must admire the dedication of fans as discomfort related to the cold did not end with the game. Spectators who travelled from Grande Prairie to Lake Saskatoon faced a long cold drive home – at least four hours. Now it does not take much longer to drive to Edmonton. Heated rocks would have cooled by the end of the game and the spectators would have returned to cold dark homes upon their arrival in Grande Prairie. Before the teamsters could call it a day horses had to be watered, fed and unharnessed by the dim light of a hurricane lantern. In the frigid house coal oil lamps would be ignited, and maybe a snack would be consumed in unheated quarters before retiring. Scatter rugs of moose, buffalo or bear hides provided some protection from frosty floors but the returning spectators and players alike could not look forward to thawing out until they curled up under heavy wool or down quilts. How many hockey enthusiasts today would have that kind of devotion to a game? This is the Grande Prairie skyline looking east from the top of the Bear Creek hill in 1918. It shows a team of horses leaving town on Richmond Avenue toiling up the creek bank heading west. It is the route that Grande Prairie fans would have followed four years earlier in 1914 on their way to watch that first ever recorded hockey game in the Peace Country played on Saskatoon Lake. The Wapiti Arena, constructed shortly after WW 1 was located near the water tower that dominated the Grande Prairie horizon for many years. The appearance of three elevators in the distance indicates that the ED and BC railroad had arrived. The following December the Tribune predicted that Grande Prairie would be the Mecca of ice sport in 1915. It went on to announce a December gathering at Salmond’s Hotel to form “a substantial club and prove to hockey players that are available for a team that Grande Prairie is ever ready to support good, clean, healthy sport.” The two game 1914 events cemented the town’s interest in moving the hockey agenda forward and more than that, the series sparked interest in surrounding communities who wanted to join the hockey action. Although the inflated notion of the Stanley cup coming to Grande Prairie has not yet materialized it is worth noting that the Grande Prairie/Lake Saskatoon rivalry a century ago was a land-mark event: a harbinger of good things to come: the real beginning of Grande Prairie hockey. 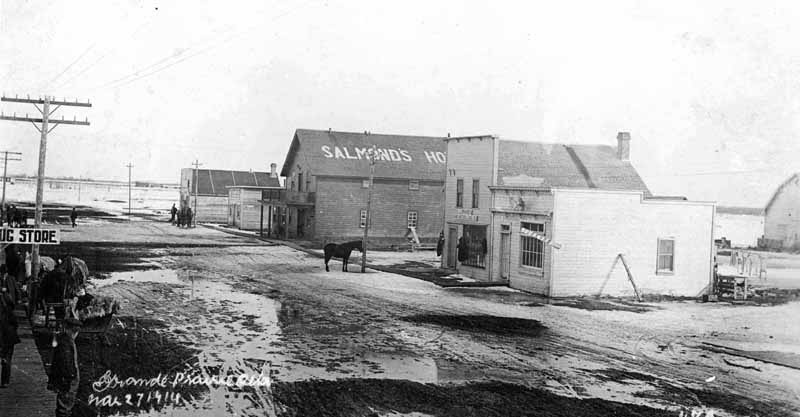 Salmond’s Hotel was the venue for the December 1914 meeting of hockey enthusiasts who gathered to put together a blueprint for hockey in Grande Prairie. Billy Salmond was an early settler, businessman and homesteader who owned land and farmed immediately north of town. He was a keen supporter of the game and played on one of Grande Prairie’s early teams. This was Richmond Ave. in 1914 – notice the horses tethered on the hamlet’s main street. Grande Prairie and nearby Lake Saskatoon were not only competing for supremacy in hockey at the time but also for supremacy as the commercial center for the region. Fortunately for Grande Prairie the larger stake of commercial dominance was not determined on the ice. 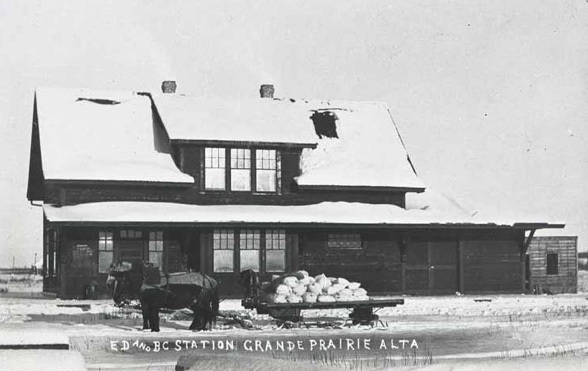 Commercial superiority was determined in 1916 when the railroad from Edmonton was routed through Grande Prairie and when it was extended northward it by-passed Lake Saskatoon. 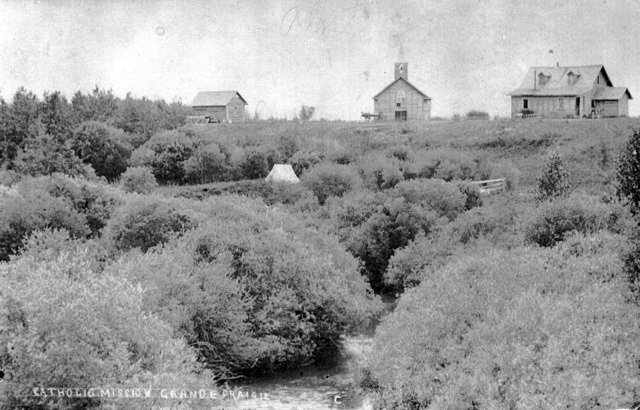 While Lake Saskatoon shrank when the railroad arrived Grande Prairie grew quickly attaining designation as a town in 1920 with a population of 2,500. There were five banks, a hospital, high school, water works, electric light plant, telephone system, farmer’s market, several churches, fire department, a movie theater, and a covered ice rink. In January, 1958 Grande Prairie became a city and in spite of its remote northern location it boasted the ability to provide its residents with all of the amenities enjoyed by larger centres to the south. The railroad station as it is seen here changed little for many years. Raw recruits who signed up for WW I and II left from this location to join the conflicts in Europe. Goods from far away Edmonton were picked up here including two day old Edmonton Bulletins and Journals. Many settlers seeking homesteads farther north in areas such as Fort St. John shipped their goods to the railhead and then hitched their horses to wagons. 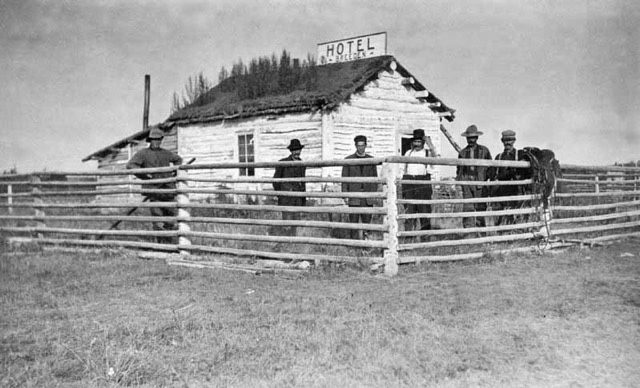 The Breeden establishment; Grande Prairie’s first hotel is a shelter of sorts but a sod roof would not guarantee a dry night’s rest during a rain. The stovepipe protruding from the lean-to indicates a wood-burning stove, likely the hotel’s only luxury. Even at mid-day it would have been dark inside. Transportation too was primitive limiting the viability of hockey leagues and competition between towns separated by more than about twenty-five miles. There were no cars but even with cars, road conditions were unsuitable for driving much of the year. Without cars there was no need for garages or mechanics. Instead there were livery barns and blacksmith shops. There were no Hertz agencies but one could rent horses from the livery barn. “Smithies” repaired wagons and shod horses. “According to my memory the first specialized skate-sharpening machine came to town in the mid forties. Until then Mr. Neal, a quiet gentle blacksmith with a small shop near the railway station sharpened my skates. For a dime twice a year he meticulously cross-filed my skates by hand. Neither of us knew about hollow grinds or “rockering” a skate blade.” (Ron Neufeld). 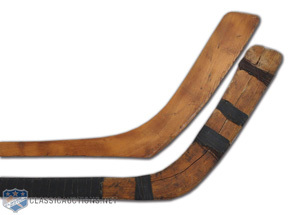 Changes in hockey equipment over the years have certainly changed the game. You may be sure, for example, that players on the 1914 Lake Saskatoon and Grande Prairie teams would have scoffed at helmets, visors and cages. Today Light weight cement hard boots are form fitted to a players foot providing a level of stability that was impossible with blades strapped to shoes or the flimsy ankle-high leather boots used in 1914. 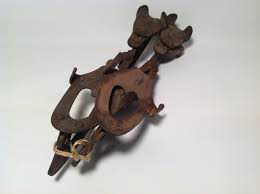 Similarly, skate blades today are rockered for an individual’s preference and the position played. A properly rockered blade accommodates significantly greater maneuverability. However some of the changes in equipment do not have positive outcomes. For example the hard plastics used for contemporary elbow and shoulder pads are armour-like. While they provide effective protection they are potentially lethal weapons and sadly are sometimes used as such. “I inherited equipment such as shoulder, elbow and shin pads from my Dad who played hockey in the early nineties in Winkler and Brandon Manitoba. They were made of thick felt with soft leather cups covering shoulders, elbows and kneecaps. The felt lining became increasingly heavy as it absorbed perspiration during a game. This equipment offered adequate protection provided my opponents were not motivated to hospitalize me.” (Ron Neufeld). As for early sticks – they were surely one-piece wooden implements - a closer relative to the clubs of cave men than to the finely crafted modern composite sticks with lie, flex and curve carefully tailored to an individual player’s size and playing style. 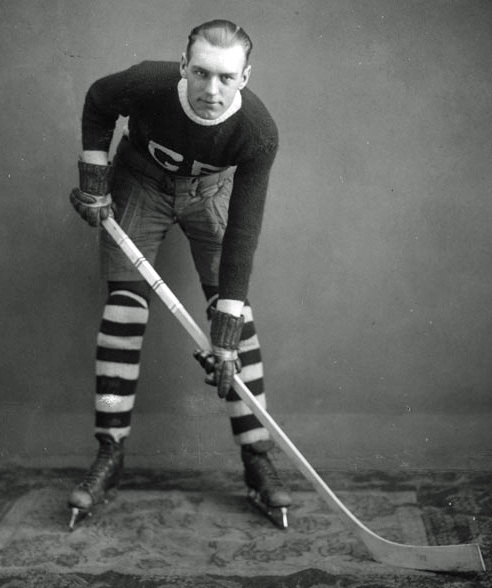 Shooting a puck at over 100 miles per hour was unthinkable in 1914. Old hockey equipment from the early 1900s. Shown above are examples of the kind of equipment, skates and sticks that were used early in the century. Also shown is a player in full hockey dress - possibly Frank Donald’s son – the first player to leave Grande Prairie to play professionally. He is modeling the kind of hockey equipment that would have been used during the 1914 Saskatoon Lake/Grande Prairie games. Notice the short canvas pants with a few wooden slats sewn into the fabric, the limited padding for shoulders and elbows, meager shin pads, flat skate blades and the one piece wooden stick. Quite apart from the advantages players today gain from improved equipment, they are bigger and stronger. Even at the minor ranks young people devote countless hours to fitness and skill training. Attending to essential daily and weekly routines early in the twentieth century allowed limited time for leisure pursuits. Yet, whether man or woman, old or young, this account of hockey in 1914 illustrates the need to play and the will to make it happen. Among the reasons given for expending energy, sometimes to the outer limits of human endurance are the need for exercise, fitness, entertainment, companionship, competition, experiencing the sheer pleasure of testing one’s physical limitations or finding relief from stressful or tedious activities related to the necessity of making a living. Many, maybe even greater numbers of people than those who play find an outlet as spectators taking pleasure from watching sons, daughters, husbands, or wives perform. Such was the will and determination of players and fans that participated in or witnessed those hockey games one hundred years ago. Be it as a participant or observer, throughout Grande Prairie’s entire history, hockey has been an important form of recreation for old and young and over the years it has proven to be a popular form of entertainment for spectators. Somehow, even the homesteaders made time for it. In Grande Prairie’s early years it was, at times the only game in town especially on Saturday nights in mid-winter after the war. With the advent of a covered rink fans crowded into the legendary Wapiti Arena or dialed radios to 1350 where they could listen to the engaging play-by- play of Fran Tanner, the Peace Country’s Foster Hewitt – but that’s a “fast forward”. Fran Tanner’s story and events that took place in the Wapiti Arena are covered in a future edition. Beginning in 1913, for five cents per copy one could follow local hockey in the sports column of the bi-weekly Tribune. The point is that the 1914/15 matches heralded hockey as a major recreational outlet in Grande Prairie. Clearly, the two 1914 games stirred a great deal of interest in hockey throughout the region. It was evidence that the settlers were indeed “settling” and were ready for something more than dawn to dusk and seven days per week of labour to prove up homesteads or otherwise get established. Furthermore it was apparent that community spirit had developed within scattered populations surrounding post offices and small country schools such as Kleskun Lake, Glen Leslie, Sexsmith, Clairmont, Lake Saskatoon, Beaverlodge, Hythe and Grande Prairie. Although centres were small and dispersed there was talk of more teams and even a league. A league of sorts was not unrealistic since only seven bodies were needed to constitute a team. If seven players could not be recruited in a single postal catchment area more than one community could have combined to form a team. 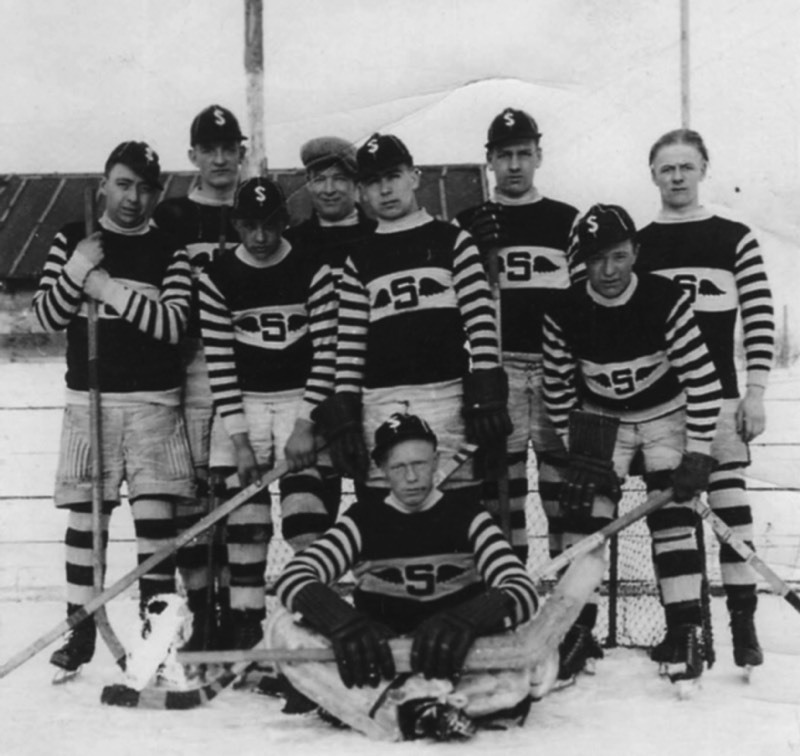 The “S” on the sweaters stands for Sexsmith; a neigbouring community that competed against Grande Prairie in one of the early post war leagues. Frank Edmundson, (father of Hockey Legend Duke Edmundson) is the player in the back row without a hat. Frank played on the first ever Grande Prairie Red Devil team. Notice the short canvas hockey pants and lack of shoulder and elbow pads. Unfortunately the dream of league competition was not to be realized for a number of years. The ambition of forming a South Peace Hockey League was brought to an abrupt halt with the 1914 August declaration of war in Europe. With news of war Bill Scott reports that young men from Grande Prairie began returning to points in Eastern Canada and Britain to prepare for active service. Residency and homestead improvement requirements were suspended allowing homesteaders to enlist. Following the onset of WW1, it was not uncommon to see young men gathering at the railway station surrounded by friends and family. Many traveled to Edmonton where they joined the Canadian Expeditionary Force little knowing what they were to face in the days ahead. In August, 1915, fifty young men responded to a recruitment drive in Grande Prairie by the 66th Battalion. (reference Bill Scott). Some would not return. The spigot of potential players for a hockey team from any given community much less a league in the region was turned off. Before the hockey spigot was shut down one “last hurrah” was reported in the March 23rd, 1915 issue of the Herald Tribune. The event drew front-page coverage by Tribune Editor Pratt and might well deserve recognition in the Guinness Book of World Records. It was March, 1915, a month that has often seen the mercury drop below forty. 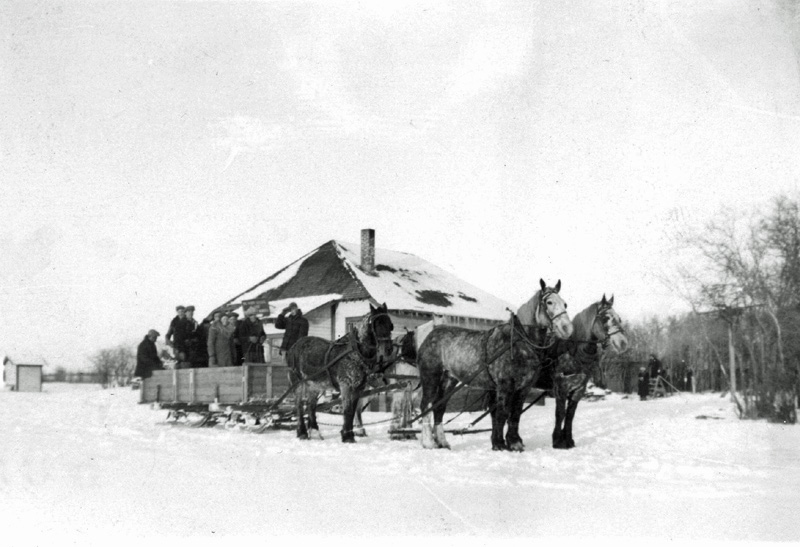 Nine hockey players from Peace River Crossing with hockey gear, piled into a horse drawn sled and when they returned home from their epic journey they had covered 320 miles that Pratt alleged “… will go down in the annals of history as a record in the Canadian Northwest, if not the American continent.” They had defeated all hockey competition north of the Peace and were eager to test their skills against their South Peace neighbours. They were described as former college students, most of them having come from Edmonton. It was agreed that three games would be played in Lake Saskatoon against a team consisting of Grande Prairie and Saskatoon Lake players – the South Peace All-Stars. No picture of the Peace River hockey team is available. However, this photo of the Buffalo Lakes hockey team embarking on a road trip is what the Peace River contingent would have looked like as they prepared for their epic journey to Grande Prairie and Saskatoon Lake. How the complicated necessities of food, water and shelter for men and beasts on this epic journey is not recorded. It was a remarkable feat. This account of hockey during the Peace countries pioneer era represents recreation in its purest form unsullied by “bucks and politics”. Players took to the ice for the sheer joy of playing, testing their skills, competing for fun and to bolster the hometown’s reputation. Those on and off the ice were friends and neighbours. There was no charge for playing and no admission fee for spectators. No money changed hands unless perhaps there were friendly bets reflecting the emerging community spirit of the neighbouring hamlets. Organization and organizations behind the teams were minimal, there was no money involved, everyone was self-sponsored; hockey was not a business in any way. In the days following the matches you may be sure that hockey was the “talk of the town” with everyone having an opinion about the best plays, the best players and the best team. The 1914 century-old rivalry between Grande Prairie and Lake Saskatoon and the 1915 series against the North Peace team established the foundation for Grande Prairie hockey and the game as we know it today throughout the Peace River country. Regrettably there is no record of kids playing the game prior to WW 1 but there is little doubt that kids strapped bob skates to their boots and scrimmages occurred on Bear Creek and on nearby ponds. The evolution of Grande Prairie hockey experienced a significant hiccup due to WW 1. However, it recovered quickly after the war and over the years since then hockey has become a major recreational activity in terms of the number of people it engages across the age spectrum, the profile it has established and the growth it has experienced from 1914/15 to the present. Furthermore Grande Prairie athletes have made their mark far beyond the borders of their hometown. Numerous local players have brought notoriety to Grande Prairie on the world stage performing at the highest levels on teams throughout North America and in Europe. The 1915 hockey series between the North and South Peace contenders was a dramatic finish to Pre-WW 1 hockey but fantasies of a league were not realized for some time. Unlike events in WW 11 there is no record of hockey played overseas during WW 1. As mentioned above, there was likely some skating and perhaps hockey scrimmages on ponds or Bear Creek during the war but no oral history or written reports are available to tell the stories. All that changed when the veterans came home. They ushered in a remarkable revival of hockey. By 1919 many barriers associated with distance and road conditions had changed and development of the game picked up where it had ended four years earlier. Also, in 1919 Grande Prairie became the proud owner of the first covered rink in the Peace, the Wapiti Arena. An important observation related to the 1914 series is that hockey was not then nor is it now a discrete activity in any community. That was perhaps more apparent during the early years and in small communities where fewer activities compete for attention. However, even today hockey reflects and at the same time is a reflection of the social, cultural and economic setting in which it is played. This story of Grande Prairie’s hockey heritage strives to capture a three-dimensional perspective of the game. That is accomplished by acknowledging the context in which it is played - context makes a difference. This is Grande Prairie’s unique hockey story. It all started with a “puck drop” one hundred years ago. Watch for further episodes of “One Hundred Years of Grande Prairie Hockey History”.